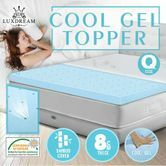 The series of Cool Gel Memory Foam Mattress Topper can bring a new sleeping experience with its specialized cool gel material. Crafted with numerous ventilation holes, this kind of ventilated gel captures heat to enhance air flow, avoiding the sweat and moisture problem during your sleep nights. And the memory foam with proper softness conforms to physical curves, reducing pressure points on your neck, shoulders and back. Being 8cm thick, it’s ideal to serve as a mattress protector and an instant bed on floor. Besides adding an extra layer of comfort on your bed, the cool gel memory foam toppers are also made of anti-mites and anti-bacterial fabric to prevent allergies and other health problems. And the natural bamboo cover made of non-slip fabric can create an ultra-soft sleeping surface for you. No-slip bottom keeps the topper can keep the topper from slipping away. Moreover, this topper can be carried along with your camping trips because of the foldable soft material, which makes it easily-rolled. Take a comfy and portable bed no matter where you go, and enjoy dreamy comfort during all your sleeping nights! Open-cell technology prevents lasting body impressions. So happy to purchase this Cool Gel Memory Foam Toppervery comfortable. I believe it can bring a new sleeping experience with its specialized cool gel material.